Today I started the verjus brew. I decided to put a bit of organic vegetable glycerine in since glycerine is effective for extracting the tannins. It adds a touch of unique sweetness too. Like I said in yesterday's post, I'm making this with little knowledge of the process, yet trusting my experience with making tinctures, cordials and liqueurs and my inner knowing. I like the astringency of tannins and figure it will add to the pucker that this beverage-n-condiment is meant to have. We shall see. All in good time. We're barely into autumn and I'm already thinking of spring - well, winter - well, next year's garden. This evening's dinner included use of the largest, sweetest most beautiful Brandywine heirloom tomato from my garden that I just had to save some of those seeds. So I made effort to collect them, to rinse them and lay them on a plate to dry of their own accord. Like jewels, aren't they? Simply shimmering with promise. All one-on-one private sessions ~ in person or over the phone ~ are offered PWYW (Pay What You Wish). This includes all wellness consultations, healing sessions, readings, private sessions of every kind. Classes and workshops are offered separately (see below), though consultations can be highly educational ~ in fact, I hope that they are! All sessions are By Appointment Only. Phone consultations also available. Walk in the Woods School of Herbal Wellness offers herbal studies in a combination of Core Modules, Electives and Apprenticeship, that may be taken as desired or with an objective to complete certification - your choice. Course changes are made to these offerings most every year, though the basic structure remains intact. Core Classes are scheduled with the current student/s in mind. This means many classes are offered one-on-one, and scheduled to fit your need/s and availability. Walk in the Woods School of Herbal Wellness offers a certificate of completion that is awarded upon fulfillment of required Core and Elective studies as outlined below, including 25 hours of Apprenticeship and demonstration of mastery. Commitment to the certification program is not required and need not hinder you from exploring any of these classes. Your herbal studies may be pursued over time as desired or needed, allowing for flexibility of schedule, commitment and financial considerations. For more information regarding these studies please contact me for a FAQ sheet. 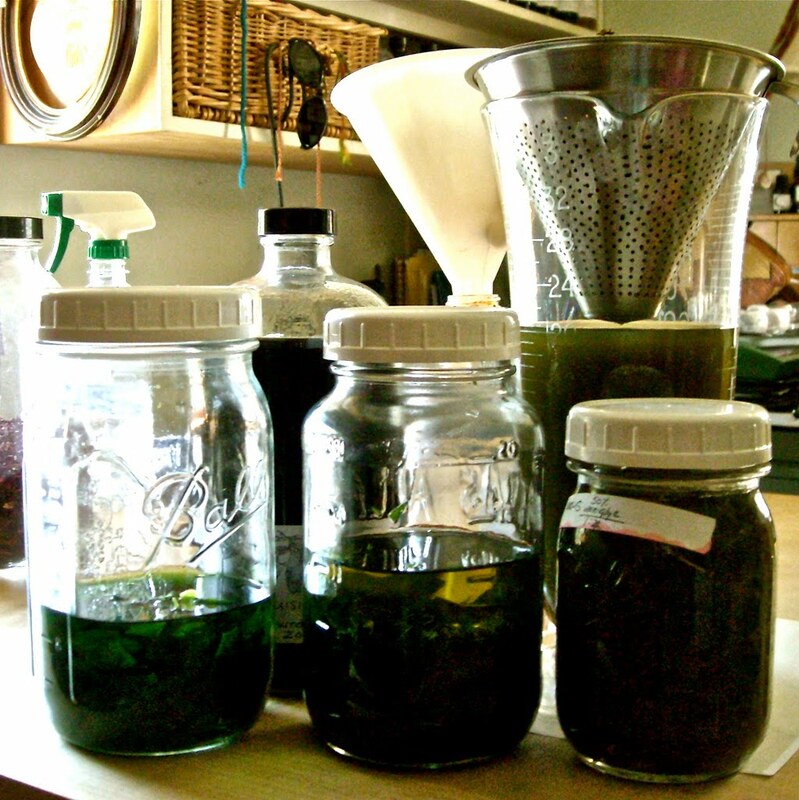 Making Herbal Medicines - A "Core" class open to everyone! ~ creative play and intuitive art workshops inspired to nurture holistic health, wellness and growth. Create your own Art Journal - learn a simple method of bookbinding to create your very own art journal. heART journaling Sundays - informal gathering to create together in intention and community. Seasonal. Why heART journal? - a mixed media art journal workshop to explore some of the (infinite) motivations, reasons and benefits to journaling with imagery as well as words. Who Am I? - a mixed media heART journal workshop to explore all that you do, all that you love, all that you are. Divine Your Divinity - a workshop to explore the "Face of the Feminine Divine" as you perceive it, as you relate to it, and to create “Her” image using meditation, intention, paint and mixed media techniques, all the while nurturing relationship with your spiritual connection to Life. Waking the Wild Womyn - a workshop intended to excavate, wake, love and express your wild-womyn-child! You will be guided in creating journeys and pieces of healing art that open you to your inner wildness, that part of you that's be tamed, tempered, even caged, perhaps since you were a we one. You can join us on Facebook to receive class notices, stay up to date and partake of other creative fun and sharing that we engage in there. Greetings! My name is Rosemari Roast. I am owner of and caretaker to Walk in the Woods, LLC, a holistic wellness practice and creative studio at Whiting Mills in sunny Winsted, Connecticut. I am called Medicine Womyn, herbalist, healer, artist and backyard farmer (among other things). As an herbalist and healer, I am dedicated to *returning home* the Medicine of the People. I do this by offering you opportunities to reconnect with your own power through exploring the wellness choices that you have - and have always had. I strive to help you to see, acknowledge, honor and act on the choices and behaviors that nourish and sustain you, and that may best serve you in your life. Everything I do, I teach. I feel that my name, originally spelled Rosemary, like the herb, is a key to my life purpose, for it is often described and the herb of remembrance. That my maternal grandmother clung to and adapted the ways of the "old country" to a "new" country is a holistic taproot for me, for it both saddens and motivates me to remember and revive the empowering practices that she employed. Practices that were discounted and forgotten in a single generation. She wild harvested, made Medicines and engaged some mystical healing practices as well. I feel a a duty to keep these practices alive, for they are surely overflowing with Medicine of meaning and value! When I was a little girl just starting school, the teachers and administrators were worried about me because I wouldn't talk to the teachers. I was responsive with my peers, but not the authorities. I can say that, in many ways, this behavior is still with me. But I digress... I was sent to the school psychologist. I wouldn't talk to him either. So he gave me paper and crayons. I drew. And from those drawings he made the judgement that I was fine, and the recommendation to return me to my class, and allow me to evolve in my own way. In this experience is another taproot to an important Medicine in my life: Creative expression, also known as art. These taproots are, from my perspective, rooted in Mystery. So it is that herbs, art and spirit guide my Life with the Medicine that they all offer. I do my best to share my Medicine-experiences through workshops, lectures, private consultations and classes. Private consultations take on many flavors, from conventional holistic approaches to instructional sessions, which may include customized herbals, eclectic healing sessions, plant spirit healing, meditation, creative expression or some other intuitively guided wellness option that is fitting for you. If herbalism is of interest to you, My School of Herbal Wellness offers one way for you to explore your botanical choices and your holistic power. It's a pay-as-you-go course of facilitated self-study currently offered to folks in my region, so you learn and grow at your own pace. You can learn more about these offerings here. I also support personal healing and growth through the arts and creative expression - journaling, drumming, chant, movement, art, craft, tarot and Crone Stone readings. Creative expression is a vital tool that supports holistic healing, growth and awareness on all levels as we explore our personal relationships with symbols, metaphors, archetypes and stories. I can support you in this journey, and - more importantly - offer you ways to support yourself. With every service that I offer, I strive to help you re-discover the natural healer within, so that you may nurture peace with yourSelf, love yourSelf, and offer these qualities to those you love … and to help bring the Medicine of the People back home - to all of us. I invite you to join me in working together to return wisdom, wellness, healing back to the hands of their rightful and most grateful owners - To us. To all of us. Together let's reclaim our power and return the Medicine of the people back to the people. Let's bring it home together! While I consider myself Self-Taught in most every aspect of my life, be it with herbs or art or whatever, I have studied formally, and continue to read, take classes and workshops that support and nurture all the parts of me. So, if you have any questions about who I am, what I do and how I can help you to help yourself, please just let me know! Join us on Facebook to stay in touch, receive event/class notices... or sign up for my monthly eNewsletter here! Be well by Nature! Peace. Last week I received my sketchbook for The Sketchbook Project which I learned about earlier this month from Kristina of Painting with Trees. I hemmed the first day, hawed the second, then committed on the third. It seems a project fitting to me in this season, one that will offer a modest dose of discipline to my artistic activities. Activities which wane in spring and summer, and wax in autumn and winter. It's a "good" fit. So today, between a score of other tasks, I made time to prep one half of the pages for my creative intentions. Tomorrow the other half will be prepped. Then begins three months of creating … something on those pages. Something that expresses my theme, "Down Your Street." And the voices are already whispering. So, yeah … that's what I made today. Peace. These past couple days I've made myself comfortable at home after several days away in the woods on The Farm with friends and loved ones. For several years now we find ourselves gathering in spring, in high summer and again - now - at summer's close to celebrate the season of Harvest and share community by way of food, fire, kinship, story, craft, art, drumming, laughter, hay rides and more. And lots of love. I've been home since sunday evening and now I'm weaving my daily routines back into place and doing my best to honor the exit of these final days of summer as I prepare for autumn's formal arrival. It's a challenge for me this year, to bid farewell to summer, for it feels as if much of summer was pulled out from under my feet. Even so, I look forward to the close of the high growing season, to preserving the last of the garden harvests, to moving indoors, cooking warming meals and settling in for the winter to follow. There's still a couple of active months ahead of me, but for now I turn my attention to the autumn seeds, the spinning of the earth, the spinning of the seasons, and the webs I choose to weave from the spirals of harvest's bounty. Weary Summer blushes as Pristine Autumn edges her way into the realm of all that is seen and unseen. I blush too. Today I started a quart batch of coffee liqueur. This was inspired the other evening during cocktail hour, when I breezed through my bartender books and flash cards for a little inspiration. I saw a drink that called for coffee brandy. I thought to myself … I have coffee … I have brandy. So today I ground beans enough for about a six-cup pot, placed them in the jar and covered them with love and brandy. I'll let this sit and macerate for 6-8 weeks before adjusting for flavor or adding the sugar. That's my standard process for liqueurs and cordials. All I can say right now is that after just a few short hours it looks gorgeous and smells pretty darn good. I am confident that it will just get better as it works its magic over the coming weeks. Today I made a jar of my grandmother's hot peppers. I love these little ringlets and put them on just about everything - pasta, pizza, vegetables, salad, Italian bread, breakfast eggs, and so on. They are a delicious and simple honor to a maternal grandparent. I slice fresh cayenne peppers into small rings (any hot pepper will work, by the way), place them in a colander and salt them so that excess water from the peppers can sweat and drain for just a couple-few hours. Then I slice some fresh, garden garlic and get my dried oregano down off the herb shelf. I put a slice or two of garlic in the bottom of a glass jar, add a pinch of oregano and then a layer of the peppers, about an inch or so. I sprinkle a little salt on the peppers and continue to layer these until all the peppers are in. Then I pour extra virgin olive oil in the jar until the peppers are completely covered. I usually leave this on the kitchen counter for a couple, few hours at room temperature before placing the jar into the refrigerator. These aren't keepers, though they do get better as the days go by, and the oil is fantastic! Even so, no matter how big of a jar I make I always finish them before they even have a chance to start thinking about going bad. That's right. More tomato puree. Saturday's farmers' market yielded, among other things, another 70 pounds of tomatoes for me to work with as I patiently wait for my own to come ripe in the garden. So in the past week I've put by enough puree to have a quart a week over the coming year. Not too shabby, and compared to last year, it's a outright goldmine. So down to the winter pantry in the basement they go. That's what I made today. Today I made a dent in my sage. A small dent, but a dent nonetheless. I finally got to the wise, green beauty for a partial harvest and made about 25 bundles for drying. They're hanging in my little hut now, releasing their fragrant wisdom into the air. And I breathe in deep. I have more to harvest and dry. All in good time. Tomorrow I head to the Watertown, CT Farmers Market. I'll be doing an "Intro to Herbalism" presentation in the morning, followed by browsing and some shopping, as well a picking up another 70 pounds of tomatoes from Dinebergs Farm. I'm looking forward to it. Even to the work and sweat that will follow.